Dawkins rented from the Negreponte family a house north-west of the Acropolis on the corner of what are nowadays Muller and Kerameikos Streets. [?still standing] There is some doubt about the next location of the legation but a house in the area of present-day Agias Filotheis Street is probable. By 1859 the legation had leased a house, from Ambrosius Rallis, on the corner of what became Euripides and Dragatzani Streets on the north side of the Square of the Mint. Designed by the architect Stamatios Kleanthes, and built in 1835, this was a fine neo-classical house with a large shady garden, and it made an ideal legation. The Office of Works took over the lease in 1885 and negotiated a 16-year term at £500 per annum, but with the repairing liability falling upon the lessee. Before this lease expired, the Office of Works bought the house, with its 1,840 square metre site, from Mme de Brucker (Rallis’ daughter) in 1899 for about £14,000. By the 1920s, the house was over-crowded, a huge maintenance backlog had built up, and the area around it was deteriorating. It used to have magnificent views of the Acropolis but these were obliterated by new buildings in the years after the First World War. The legation remained uncomfortably in occupation until a replacement was eventually found in the mid-1930s, after which the Dragatzani Street house was sold to the National Bank of Greece in 1938 for £54,500. It was demolished during the following year. The search began in the mid-1920s. There arose the possibility of an exchange with the Athens Bourse, but that fell through. The Maximus House, facing the old Palace gardens and just completed, came on the market but the Office of Works concluded that it would be more expensive than buying a new site and building on it, and suggested that Post look for sites as well as houses. 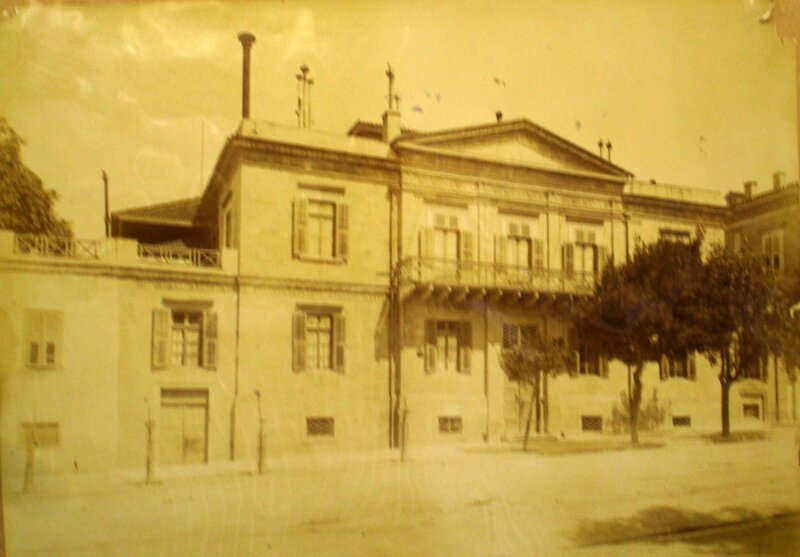 A Greek architect, M. Kouremenos, offered to take over the Dragatzani Street building, re-house the legation temporarily, and build for it anew on a site satisfactory to the British government, all at no net cost to the Office of Works: he said that his financing would be provided by the Public Functionaries Fund. The Office of Works turned him down. The exasperated minister, Percy Loraine, persuaded himself and his staff that the whole legation, including his own residence, could operate from a new suburb of Athens called Psychico, about seven kilometres from the centre, where land was cheap and the cost of buying and building anew could be recovered from the sale of the Dragatzani Street house. 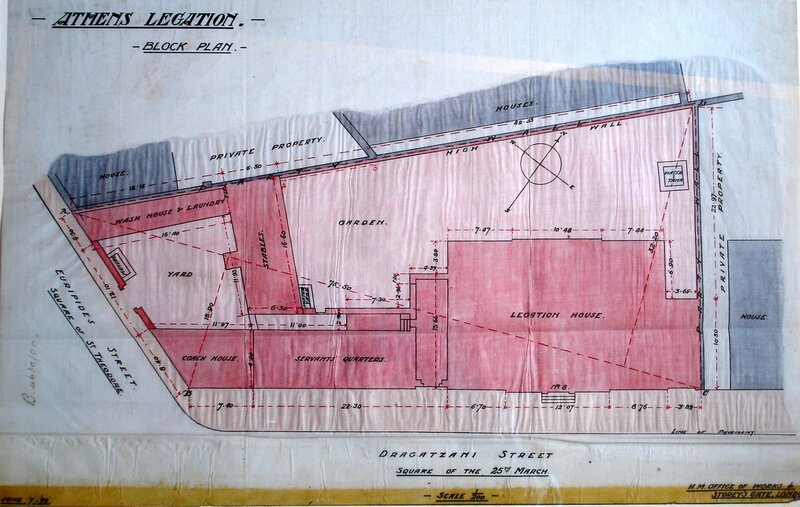 The Office of Works was doubtful that a legation so far from the city centre would work in practice, but the Foreign Office was prepared, on balance, to take Loraine’s advice. Several contiguous sites, comprising about five acres, were bought in March 1929. Shortly afterwards, Loraine was posted to Cairo. His successor, Patrick Ramsay, put a stop to the Psychico venture. The English Preparatory School was later granted use of the newly-acquired site as playing fields and it was finally sold in 1949 for £4,410 to Mr a WR Rees. After five years of unsuccessful searching, the Office of Works fell back on its solution of last resort, which was to reconstruct the Dragatzani Street house. By early 1936, the plans and the funds were ready; the clerks of works were on the point of leaving England; Sir Sydney Waterlow, the minister, had rented a house into which to decant for the duration of the works; and the reconstruction contract was due to start on 1 May 1936. Six weeks before that date arrived, there arose an unmissable opportunity for a new residence. In mid-March 1936, Eleftherios Venizelos, ‘the maker of modern Greece’, died in exile in Paris. Shortly afterwards, Waterlow was approached by Lady Crosfield, a close friend of Venizelos’s second wife, Helena Schilizzi, who said that Schilizzi wished to sell her Athens house at an attractive price to the British government for the use of the legation. In early April, Waterlow told London that ‘Mme Venizelos is most anxious for sentimental reasons that house which she completely built four years ago should become His Majesty’s Legation. House and land cost her £100,000 but she would sell to us for £50,000’. Helena Schilizzi came from a wealthy eastern Mediterranean family but was born and spent much of her life in London where she married Venizelos in 1921. She bought the land for their new house in Athens, on the corner of Vasilissis Sophias Avenue and Loukiana Street, from the National Bank of Greece in 1928 and commissioned Anastasios Metaxas as her architect. Schilizzi rather wanted a small house where she and her husband could grow old together but was pressurised by her husband’s friends and supporters into something much larger so that they could all meet there. The house, gently neo-classical, was completed in 1932. She never liked it much and had no use for it after her husband’s death. She did, however, need a way of getting some of her wealth out of Greece. Waterlow was interested, and a visit to the house soon afterwards convinced him of its mewrits. It was well located, in excellent condition, contained offices suitable for the chancery, including a large library on the lowest floor that had been planned for political meetings. A week later, Waterlow appealed to Sir Robert Vansittart, the permanent under-secretary at the Foreign Office, ‘to use your influence to secure this unexpected windfall. All that is immediately required is to divert to Mme Venizelos the sum earmarked for reconstruction of the present legation’. And the following day he reported ‘King George [of the Hellenes] asks me to tell you he hopes that we shall accept Mme Venizelos’s offer as the best solution to our problem’. He added, for good measure, that he had also learned that the scheme for building a music hall opposite the present legation was maturing fast. Howard Jones, a senior architect in the Office of Works, went to inspect the house the following week and the clerks of works’ departures were postponed. At the end of April, Alec Hardinge, Private Secretary at Buckingham Palace, told William Ormsby- Gore, first commissioner at the Office of Works, that he was hoping for favourable consideration. Patrick Duff, Secretary at the Office of Works, replied ‘One has to be pretty careful in these matters, as our sad experience here is that it is not often that one can buy a ready-made house and, even at considerable expense in adaptations, make it really satisfactory for the special purposes of a Legation and Chancery. However, we are going most carefully into this present proposition …’. At the beginning of May, Schilizzi adjusted her offer to £45,000, including £3,500 worth of fittings. Jones reckoned that the land alone was worth £30,000: although the running costs would be more than at the present legation, he thought the house would provide the best chancery offices anywhere. The Treasury agreed to the purchase in early June, subject to Parliamentary sanction. In normal circumstances, Schilizzi would be paid with drachmas obtained from the sale of the Dragatzani Street house, but she wanted payment in sterling in London, which was incompatible with Greek law. Duff asked Waterlow whether he thought ‘that the Greek government would look with a benevolent eye on some means of getting over this difficulty?’ Waterlow evidently found a way, and £45,000 was duly paid by the Office of Works through the Treasury Solicitor, and the purchase was completed on 7 October 1936. Waterlow moved into the house immediately, followed by the chancery two months later. He reported that ‘King George, the Crown Prince, Prince and Princess Nicholas of Greece, Princess Irene and Princess Katherine recently took tea in the new house and afterwards inspected it, in every corner, from the boiler room in the basement to the electric laundry on the top floor’. 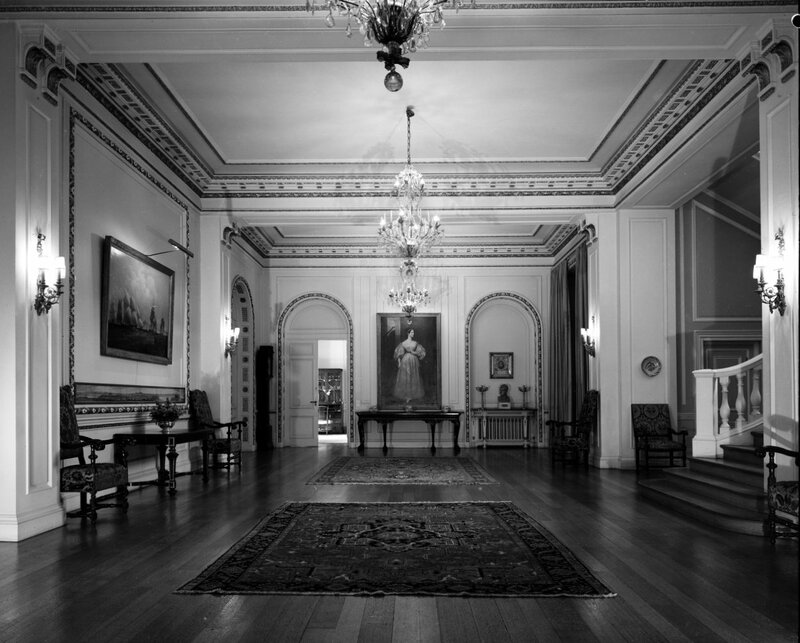 Caretakers were appointed in 1941 when the legation withdrew to London with the exiled Greek government. 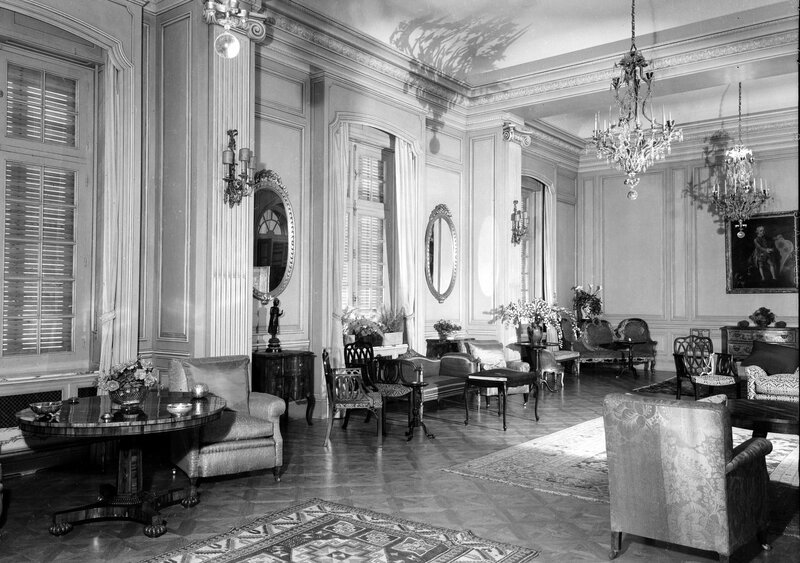 From 1942 until the end of the war, the house was occupied rent-free by the Chargé d’Affaires of Switzerland, the protecting power. 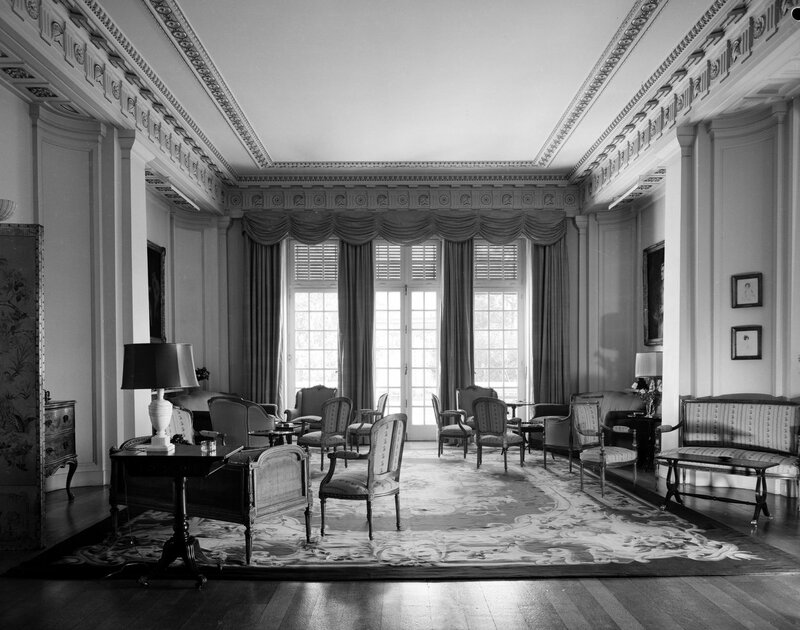 The original dining room, being used as a drawing room , 1965. Legation house on Dragatzani Street, c. 1910. Siteplan of legation house and grounds,1899. 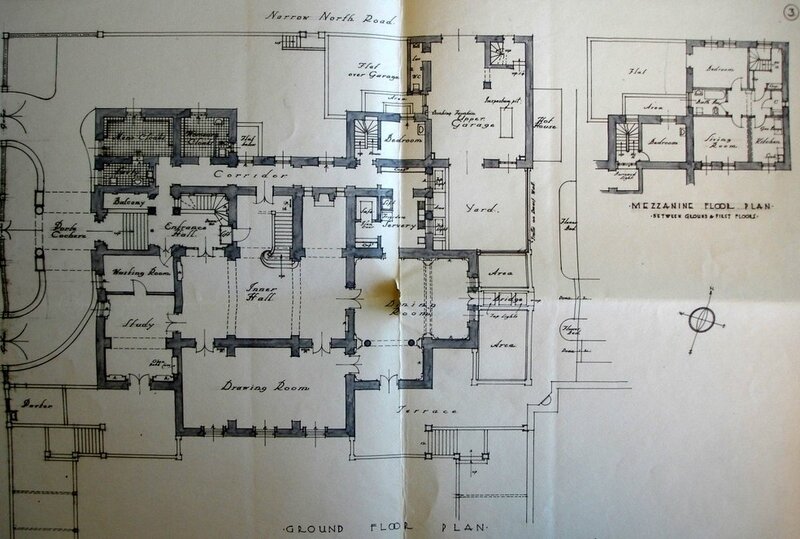 Ground floor plan of legation house, 1914. 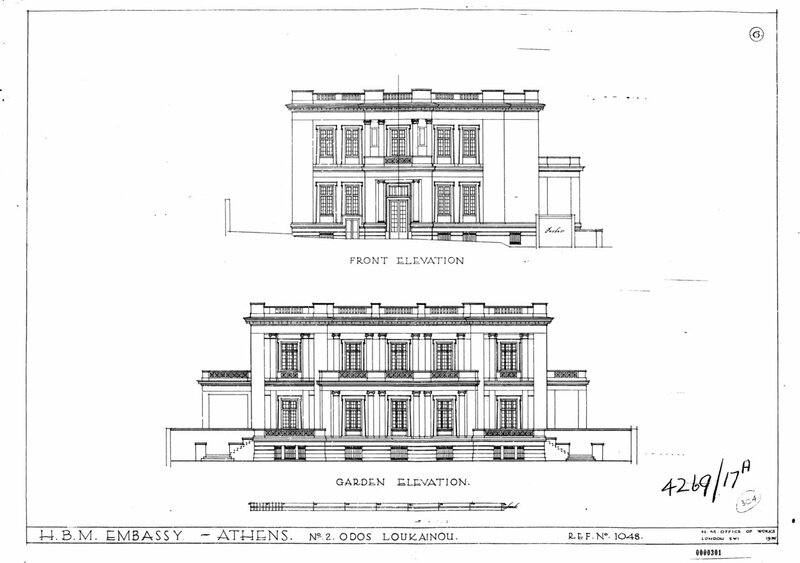 Elevation drawing of Venizelos house, 1935. 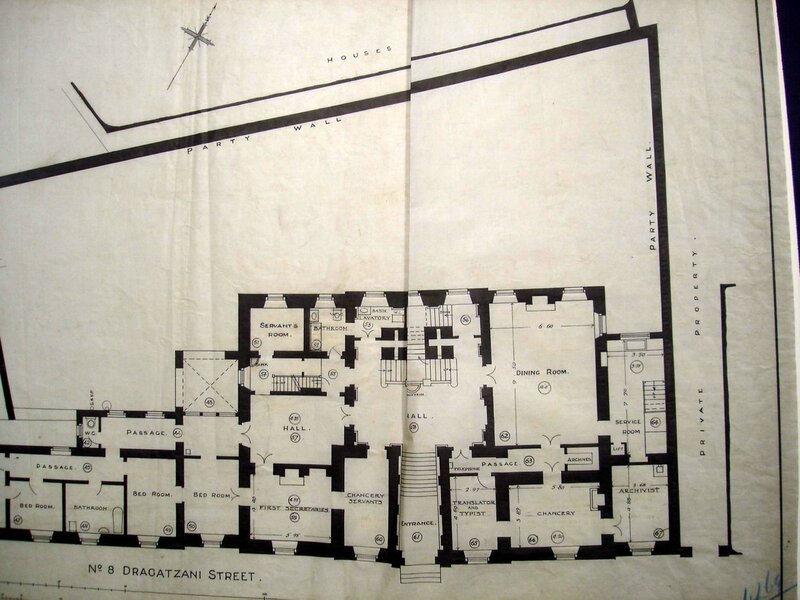 Ground floor plan of residence, 1936. 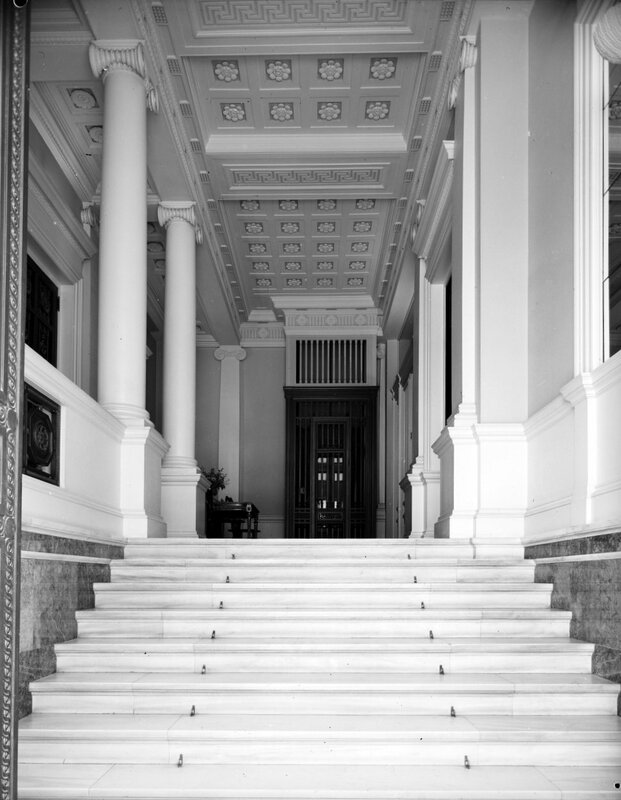 Steps to entrance hall, 1965. 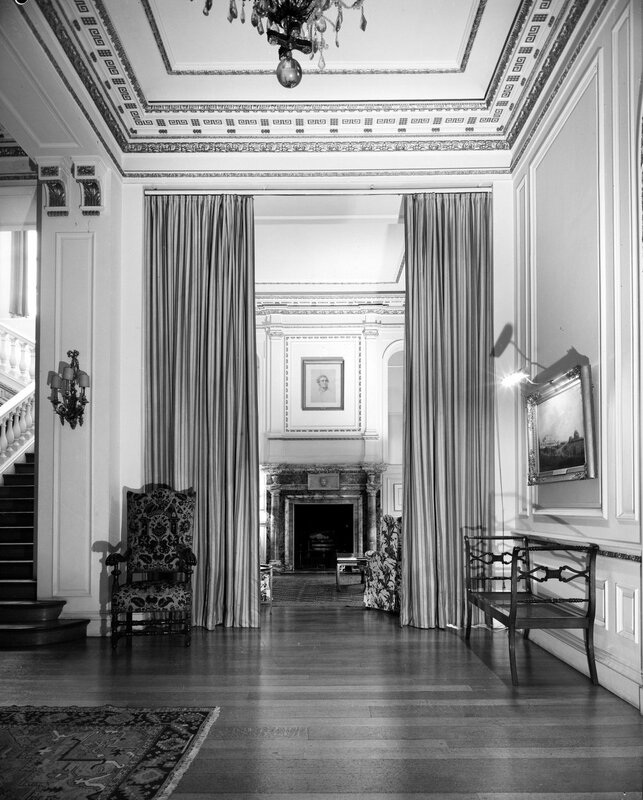 The inner hall, looking towards dining room, 1961. 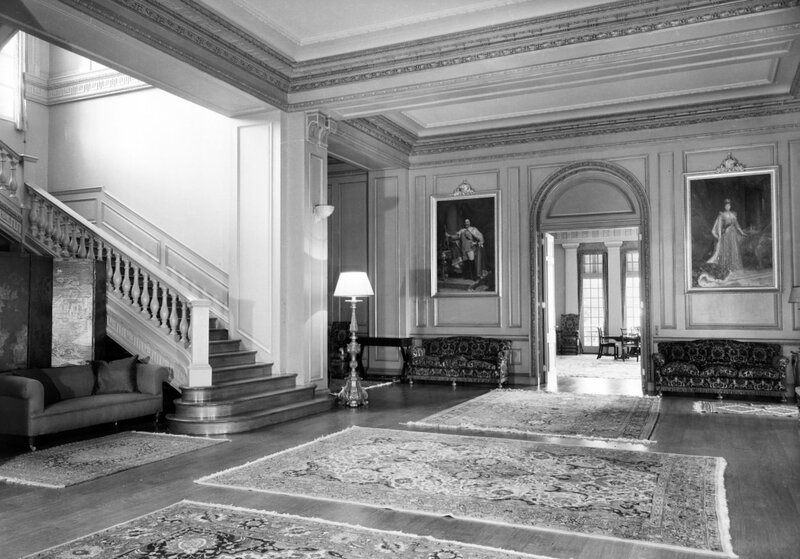 Inner hall, looking towards the study, 1965. Recess, off inner hall, 1965.